See more objects with the color grey tan darkgrey sienna dimgrey or see all the colors for this object. This is a Teapot and lid. It was designed by Franz von Zülow and manufactured by Wiener Porzellan Manufaktur, Augarten. It is dated ca. 1925 and we acquired it in 2008. Its medium is glazed and gilt molded porcelain. It is a part of the Product Design and Decorative Arts department. Franz von Zülow was a designer and artist who created designs for prints, wallpaper, fabrics, decorative household objects, painted furniture, tapestries, paintings, drawings, picture books, and other graphic works. After studying at two Viennese drawing schools, the Allgemeine Zeichenschule (General Drawing School) and the Graphische Lehr-und Versuchsanstalt (the Graphic Academy and Research Institute) in Vienna from 1901–03, he broadened his studies at the Kunstgewerbeschule (School of Arts and Crafts) until 1906. In 1905, he decorated a screen designed by Josef Hoffmann with colored woodcuts of sunflowers, a design he also adapted for a fabric pattern. He joined the Vienna Secession in 1908, and exhibited at the International Art Exhibition in Rome in 1911. In 1912, he was the recipient of the Prince of Liechtenstein’s travel stipend and spent time in Germany, France, and England. 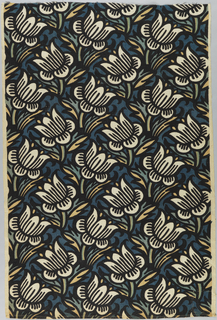 That same year he designed rugs, textiles, decorative panel paintings, and stencil designs for the Wiener Werkstätte. From 1920 to 1922 he was an instructor at the ceramics study workshop in Gmunden, Austria. In 1925, he was awarded a Gold Medal at the Paris Exposition Internationale des Arts Décoratifs et Industriels Moderne for a vase produced by the Wiener Porzellanmanufaktur at Augarten. The decoration on the vase is extremely similar to that on the breakfast set proposed for acquisition. 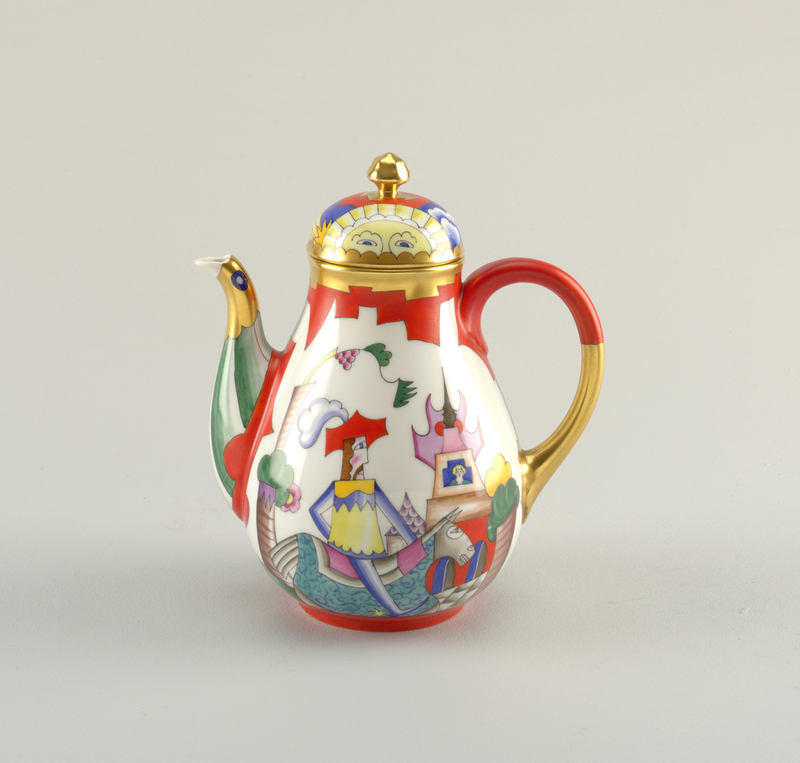 Von Zülow continued to exhibit ceramics at numerous exhibitions in Vienna through the 1930s. In 1907, early in his career, Von Zülow’s experiments with printing techniques led him to patent a method using a cut paper pattern to create a template that is colored and printed in reverse. In contrast to previous template printing, the resulting picture is not dependent upon the negative forms that have been cut out, but rather on the crosspieces that remain. These form a network of black outlines; the empty spaces between the crosspieces are often strongly colored, creating an almost cloisonné-like effect. The use of flat areas of color with black outlines is visible in the decoration of this breakfast set. This stylistic effect, combined with a folk art influence, results in naïve style ornamentation. Fantasy and fairy tale scenes, depicted with broad areas of bright color, are very visible in the pieces in this group. These forms were also used by the factory for other patterns, but the decoration is clearly Von Zülow’s. This breakfast set provides us with insight into the importance of porcelain painting in influencing the aesthetic of the era. On underside (a), stamped in blue ink: Wien mark above "Wien" / red ink overglaze: "Augarten / Austria [in rectangle]" / in black: "1/5174 / 53" / "Fr. ZüLoW."